As the founders of Val d'Isere Ski Instructors we are a team of two local skiing and snowboarding instructors. Snow sports are our passion, we know the international ski resort of Val d'Isere-Tignes: The Espace Killy like the back of our hand. Our small and friendly ski school is synonymous with high quality private instruction, guides with local knowledge and genuine hospitality. These dedicated professionals know and love the The Espace Killy. They are on the slopes every day and can take you to the most suitable runs for your ability and for each day’s unique conditions. The instructors and guides we work with are recommended not only for their skill in instruction, but also because they have welcoming personalities and want you to share their love of the mountains. Enjoy their company. Many of our guests have found that their instructors eventually become their personal friends and each year they look forward to pleasant reunions. We look forward to sharing a wonderful time with you in Val d'Isere. Alex was born and raised in the Lake Garda area of the Italian Alps by his ski instructor parents. On the piste before he could walk, Alex raced until he was 17, at Regional and National level. Located in Val d'Isère for the past 12 years, he's frequently described by clients as a "great guy to be with"- both happy and funny whilst importantly being both professional and patient. His passion for the mountains is apparent in all that he does. As a fully qualified instructor in Alpine skiing, Telemark skiing and most recently, Snowboarding, Alex has the ability to coach at all levels in all disciplines- whether you're a first time novice or an advanced, capable skier, his job is to progress you further. Julien Limon, a highly experienced instructor and guide, specializes in introducing and developing Skiers of all levels to the Off-Piste experience. 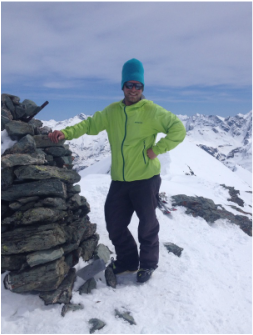 Based in Val d'Isere for more than 15 years Julien is multi lingual, has a deep knowledge of the "Espace Killy" and is well placed to lead all types and ages of client from complete beginner to the most experienced skier. When my children and I met Alessandro and Julien in 2006 we were complete beginners embarking on our first family ski holiday. Having enjoyed their expert tuition for the past ten years I am now a very competent skier and there are no snow conditions that my children can't cope with, either on piste or off. We have all benefitted from their friendly, relaxed instruction and their patience and skill at guiding us through new challenges that has helped our technique and style to progress year on year. As a family, we have had some of our happiest days skiing with the boys in Val d'Isere which I will always be so grateful for". Val d’Isere and Tignes together form L’Espace Killy, one of the largest ski areas in the world with one of the quickest, most efficient lift systems in existence. A unique skiing mecca with over 300 km of groomed runs and seemingly endless off-piste possibilities, it is the perfect spot for thrill-seekers and neophytes alike. Unbeatable powder runs, skinning routes up to 3800m have for years been a well-kept secret. Today Sainte Foy is reinventing itself and making available new ways to enjoy this fabulous terrain. Blissfully uncrowded slopes and north-facing pistes ensure snow stays good. The Aosta Valley is not only great for the sunshine and for the more expert slopes – it provides the opportunity to try some of the local gastronomy. For that alone, it’s worth the trip to La Thuile. © 2010 - 2016 COPYRIGHT 2016. ALL RIGHTS RESERVED.